Here you can configure the AquaShake function of AquaSnap. To access this screen, double-click on the tray icon, at the bottom-right corner of the screen, and click on AquaShake. The AquaShake function permits you to accomplish various operations simply by shaking the mouse cursor. Shaking mode: here you can choose between several modes. The default value is AquaShake. Disabled: when selected, nothing happen when you shake the mouse cursor. 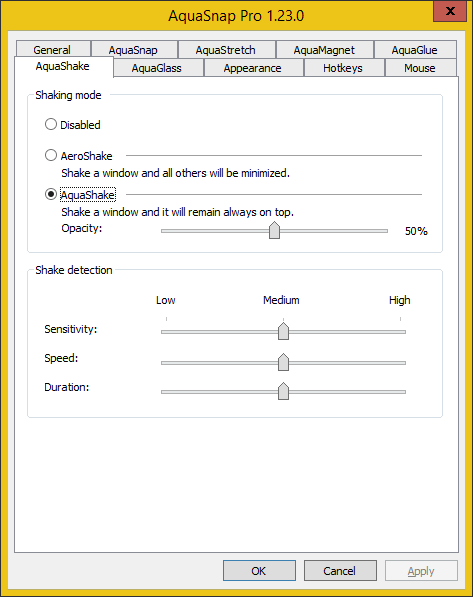 AeroShake: when selected, AquaSnap mimics the default behavior of the built-in Aero Snap function of Windows 7, which is to minimize all other windows when you shake a window. AquaShake: when selected, shaking a windows makes it become semi-transparent and stay always on top of the other windows. This is especially useful when you work with a fullscreen application but still need to see another a small window such as a calculator window. Shaking the window again will restore its normal state. Opacity: this setting allows you to change the transparency level of the pinned window. The default value is 50%. Shake detection: here you can adjust several parameters of the shake detection algorithm. Sensitivity: minimum amplitude of the mouse shake required to trigger the action. Speed: minimum speed of the mouse shake required to trigger the action. Duration: minimum duration of the mouse shake required to trigger the action.